You can ask the company of the Blessing to share his evolution ea code. Contra trade is not very useful,I always set it false,do you know? dont worry carry on @bullfrogg. I have no clue what my modification to EA have to do with Bullfrog, i already share the code and asked to test it with properly tick data. Regarding Bullfrog, i think he need to move to commercial section, cause he want to sell signals... no need to flame here. started last week on a demo account. So far only trades on eurjpy and gpdusd. Nothing on eurusd and xauusd. I have no clue what my modification to EA have to do with Bullfrog, i already share the code and asked to test it with properly tick data. Regarding Bullfrog, i think he need to move to commercial section, cause he want to sell signals... no need to flame here. regards. Thanks for adding @contratrade. I have tested it. Looks like it didnt open any new trades for me when i made startlevel 3 or 4. Can you share settings which have opened the contra trade at those levels. I have tried multiple options. When you set up the robot and it starts trading don't worry again about take profit. The robot will set and take the profit for you. Demo trade it for some time. This is a very complex EA. Here is a detail breakdown on this EA via mrtools. Here is my tester results for AUDNZD on a 5 min time frame over a 3 month period. Next step is to test it on demo account. Here is mrtools set file and results. Nice work @trader1971 good one. i will test your set file and document at first pass looks very nice. It will help in understanding blessing better. Thankyou for posting. This is good, love it when all of us work together make our forex trading better. Thanks for effort..i'm trying to adapt setting for AUDCAD that's my favourite pair for this kind of grid system and could be optimized just looking at last 2 month with biggest movement in last years... but i don't understand well which is thw main setting for tp. I've disabled trail but i've always a close order message for 70% trail reached??? confused... Could you hel me to understan better tp exit setting? Sorry cescof, at this stage I am not able to help. I only stumbled upon this thread not so long ago. As I mentioned before, this is a very complex EA, a true work of art. To truly understand this EA, one have to understand the fuzzy logic behind it. I only started learning the mt4 code language about six months ago. Still in my baby shoes so to say. I only used another guy's set files to check it out. From many observations I have come to the conclusion that in forex the basket trader EA is the most profitable. With all indicators involved in this EA, I noted that the MA bands condition not represented by any standard indicator. I created a custom indicator, just to give a visual. To understand this EA will take some time and hard work. Play it safe and keep it Green. Been looking at the next indicator in this EA, Bollinger Bands. Wow! to my surprise, Not a standard Bollinger at all. With normal Bollinger Bands one would use the iBands() function call. Blessing is using iMa() and iStdDev() function calls with parameters set to the price open. I created another custom indicator, just to give a visual. Red dotted line is distance outside bands. Family time is important !! I just love surfing the internet. Here is all the info on Blessing EA and much more. under H - there is a link on "How to build you're own set files". Very interesting reading - a must read I would say. You found this site so late. About 5 days ago I didn't even knew that Blessing existed. Fifteen hundred years ago, everybody knew the Earth was the center of the universe. Five hundred years ago, everybody knew the Earth was flat. Imagine what you'll knew tomorrow. doing good. this EA has been here for long. And it is base for lot of other EAs. Within our forum, some people have developed other EAs or Modified this EA to make their own. Your research is nice. Keep continuing the good work. I have a few questions about programming the blessing EA. Is it possible to set a stop loss ? I looked over the manual and it has different setting to what mine does which is confusing. I can only find power out stop loss. 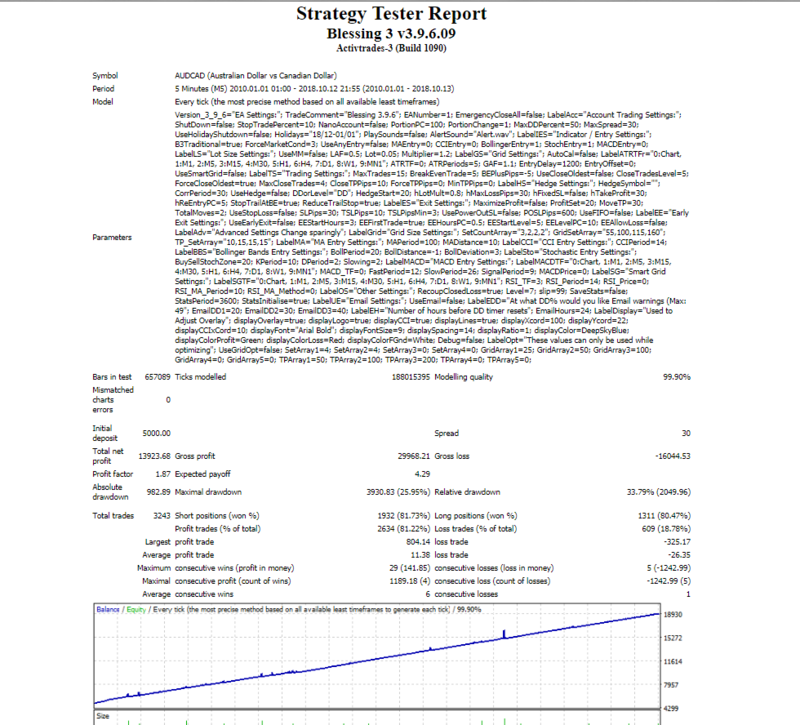 On default setting i ran it for 24 hours now and it made over $800 profit using 0.13 lots this is quite impressive.